Home » Uncategorized » Mining Bees: Are You Seeing Bee Nests Underground? Question: I have seen little mounds of earth and small bees tunneling in my garden lawn. What are they? Most people generally think that bee nests are limited to being built above ground, but this isn’t the case with many types. You have likely noticed one of a very large genus of bee which is known as the mining bee. Why Do Mining Bees Tunnel Underground? Mining bees hibernate in their nests over winter when the temperature is too low for to live above ground level. Female mining bees lay their eggs inside of the tunnel nests throughout the year where the larvae will be warm and safe from predators. The mounds of earth appear to be fairly large. Are mining bees bad for garden lawns? Absolutely not. 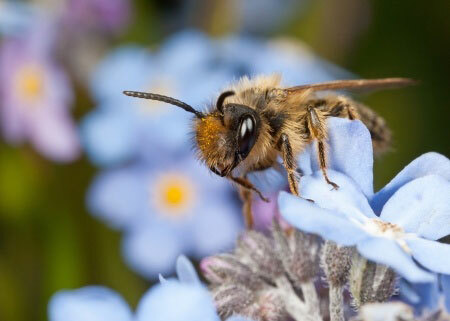 Mining bees are considered to be very beneficial to garden lawns because they help pollinate the surrounding plants. Mining bees are among the least aggressive types of bees on earth. This means that there is no need to worry about their nests being near your home or business. I don’t want any bees to nest near my home, what should I do? You should avoid using pesticides because you will kill these beneficial bees and other insects while also damaging your lawn. 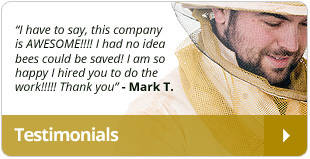 Contact We Save Bees to relocate any type of bee that nests near your home.